Dan Seigul first named the Window of Tolerance, as the level of arousal in which a person can function to the best of their ability. When an individual is in this zone they are able to process their surroundings and regulate themselves in a positive way. When we are out of our window of tolerance the pre-frontal cortex region of our brain shuts down. Consequently we struggle with our surroundings, we become less rational and we may make impulse decisions and actions. This can lead to an individual to either fight (hyper-arousal), flight (hyper-arousal) or freeze (hypo – arousal). Now this window is not the same size for everyone and for those young people who have gone through a trauma it is often particularly small. If you have led a relatively settled life your Window of Tolerance is likely to be quite big and flexible. Consequently you can handle more stress before being pushed out of your comfort zone. 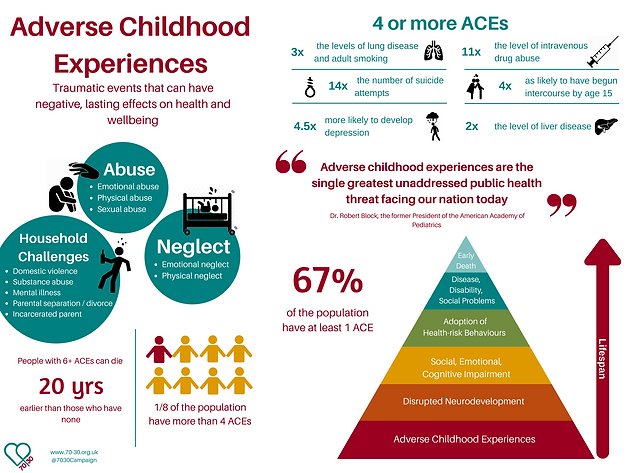 However, if we consider a child who has multiple ACEs (Adverse Childhood Experiences (see infographic below)) it is likely that their experience of the world has caused them to be wary and suspicious. If an individual feels safe and supported they are likely to manage their stress effectively. However, if they usually feel unsafe or abandoned their window of tolerance is likely to be smaller and inflexible. For these young people even a small amount of stress can cause an extreme reaction. So how might this look in a child? For those of us who work with children we have all experienced a situation where a child has been asked to do a simple task and they react in one of the three ways described above (fight, flight or freeze). A good example is public speaking. If a child has a small window of tolerance being asked to stand up in front of their class and speak could push them out of their window of tolerance causing them to freeze. Alternatively they might choose to fight and argue with the teacher about being asked to speak publicly. This can have huge consequences for a young persons mental health. A child who is unable to cope with additional stress is likely to struggle to build meaningful relationships with peers and adults. A playground tiff suddenly becomes a serious incident which could be met with violence. This child would be aware that they are different and struggle to regulate their emotions this could cause low self esteem which would go on to affect every area of their lives. Individuals may even go on to develop depression or anxiety. The good new is this is not permanent and with the right support young people can be taught techniques to regulate themselves more effectively. Mindfulness techniques can help an individual learn how to anchor themselves in the here and now and teach their body how to be calm. Additionally, protective behavior techniques such as identifying indicators of danger and stress can enable a young person to better label their emotions and assess their situation. Therapy can also be a platform for an individual to explore the trauma they might have been through in a safe and accepting environment. Such support can be accessed from early help services and the adults in the young peoples life. If someone is used to feeling unsafe or unsupported it is no wonder that their behaviour may be extreme or aggressive. As adults we must guide and reassure these young people so that they might better manage their emotions and therefore have more positive future outcomes. Beautifully and succinctly written Lara. I would also add that when children are hyper vigilant they also can pick up on body language/mood and the slightest incongruency in how they are approached may trigger their ff. These kids are experts at keeping themselves safe, so it doesnt even have to be an obvious event to adults. Authenticity when dealing with them is massive and often overlooked. Great blog! !